A biological networks analysis module for meta-analysis and visualization of interactive networks, functional characterization of intra-cellular molecules, preprocessing of transcriptomics data and biomarker discovery using a network-based pipeline. 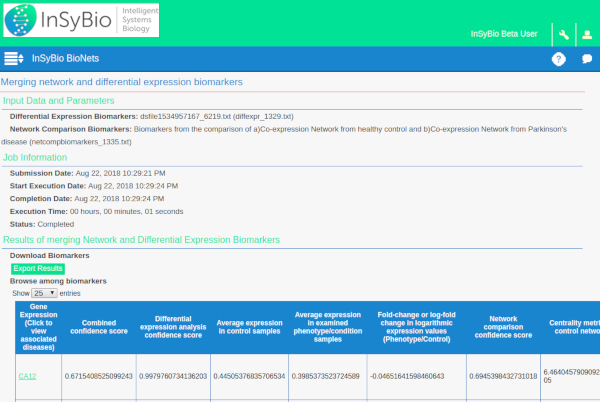 InSyBio BioNets provides a unique biomarker discovery pipeline that overcomes the constraints of existing biomarker discovery methods capitalizing on biological networks’ comparison. Specifically, InSyBio BioNets offers a systems medicine approach, which provides biomarker sets with increased predictive accuracy. The proposed pipeline is offered through a flexible semiautomated web-based analysis enabling the users to easily navigate through its different steps, while also being able to use their own algorithms and methods. This can be accomplished either by selecting algorithms offered through the InSyBio BioNets web interface, or by downloading intermediate results, processing them locally, and uploading results to continue the analysis through the web interface. In addition to the biomarker discovery pipeline, InSyBio BioNets provides a set of capabilities for the construction, preprocessing, meta-analysis, and visualization of biological networks. It also supports parsing and creating gene expression files to enable the construction and analysis of gene co-expression networks. Moreover, users can quickly analyze large biological networks and gene expression files using the user-friendly task management feature. Users also have access to informative biomarker reports, which provide information from publicly available databases and from ’s PPI repository. These reports include information about the prior insights linking biomarkers to diseases. Discovery of more compact biomarker sets with increased predictive accuracy from your own dataset using our Systems Medicine approach. Semi-automated, flexible, web-based analysis of gene expression data and biological network analysis. Minimum burden on the user’s PC with computing tasks executed in our cloud infrastructure. BioNets job dashboard tracks job progress and provides a comprehensive view of the results. Informative biomarker reports which integrate information from publicly available databases about the extracted biomarkers, information about the association of genes with diseases, and information about biomarkers' gene products and biomarkers’ significance as revealed by InSyBio BioNets approach.